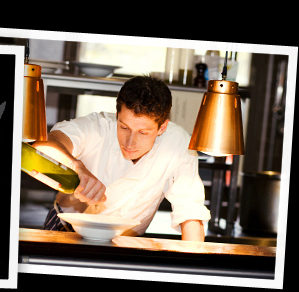 The chef’s most important tool is his kitchen knife. It is thus quite surprising that most chefs know very little about knives and how they are made and more importantly the different ways of making a knife. Let's start with steel. Steel is a mixture or amalgam of two main elements, iron and carbon. Imagine steel is like bread dough, a mixture of flour and water. This is a basic bread mix. However we all know bread can be a lot more complicated. Add some parmesan, basil pesto, maybe a little salt; suddenly the mixture is much more sophisticated. It is the same with steel. The basic steel mixture of iron and carbon can be rapidly enhanced by adding different elements. The higher the carbon content the harder the blade. What is referred to as stainless steel contains levels of chromium, normally a minimum of 11%. Chromium reduces the tendency to rust but also reduces the level of hardness that can be achieved. It is actually more accurate to call stainless steel ‘stain resistant steel’, as it stains less. The chromium forms a passive film of chromium oxide on the surface of the knife which blocks corrosion or rust. Despite this, staining can still occur in certain circumstances, which is why we cannot call it ‘Stain Free’ steel. Before the arrival of stainless or stain resistant steel, knives were historically made with what is referred to as carbon steel. This was steel with between 0.9% and 1.1% carbon. These old fashioned knives would rust and discolour but would achieve a superb cutting edge. Technically this carbon steel with no chromium is actually harder than stain resistant steel, when measured by resistance to compression. This material, despite its hardness is actually easier to sharpen that stain resistant steel. The reason for this is that stainless or stain resistant steel is more resistant to the removal of metal by abrasive sharpening. It has a different kind of toughness. When stain resistant steel arrived everyone thought it was the best thing since sliced bread! Sadly this was not the case and it caused problems with the quality of knife production. The initial problem that occurred with the use of this new steel was in the sharpening. Historically knife sharpeners in the factories were paid ''piece work''. This new material was harder to sharpen so they took longer to sharpen. The result of this was that the level of sharpness of new knives went down due to the sharpeners spending less time than they should have done on sharpening. The other problem is that the single piece stain resistant knives are much harder for the chefs themselves to sharpen. Both these problem continue to this day with any new one piece stainless or stain resistant knives. There is also a further problem that can occur with any new knife and that is overheating when sharpened. If quality control is slightly lax in any mass produced knife then the blade can be over heated when sharpened and the steel will lose its temper. This then softens the metal and reduces the life of the cutting edge. It can thus be seen that the introduction of stain resistant steel as the main metal for the construction of mass produced kitchen knives actually did more harm than good. The reason it is so widely used is that, despite it being a more expensive raw material, it did not have the corrosion factor and it was suitable for mass construction. In the 1960’s the Japanese knife makers came up with a better way of making a blade by laminating steels together which is why they are the best knives in the world. It is quite obvious that making a blade out of a single piece of stain resistant metal is a compromised construction. We are expecting that one piece of metal to do everything - be strong, be flexible, be stain resistant, hold a good edge and be easy to resharpen. Life is never that easy. Classic quality Japanese construction involves making a layered blade. The basic construction is making a sandwich of three pieces of metal. The two outside layers of the ''sandwich'' are the same slightly softer flexible stain resistant steel, and then in the middle we have an alloy which is much more suitable for a cutting core to form the edge. This is a hard high carbon steel. There are various steels that can be used for the central cutting core but it is widely accepted that the best is a steel known as VG 10 or V gold 10.This product was developed 23 years ago in Takefu by the Takefu special steel company. VG-10 is a unique formulation of steel with a high carbon content, and containing various amounts of one or more of the following: Chromium, Vanadium, Molybdenum and Cobalt. The steel is specially designed for high-quality blades used in kitchen cutlery, such as chef's knives, vegetable knives, cleavers, paring knives, carving knives and the like. VG-10 is often called "super steel" because it is designed to maintain sharpness and durability without becoming brittle, a major fault normally associated with exceptionally hard steel. This quality is ideal when extreme sharpness is desired, as most other steel will not take or keep an edge like VG-10. VG10 C:1.0% Cr:15.0% Mo:1.0% V:0.2% Co:1.5%. VG-10 should not be confused with VG-1 stainless steel. 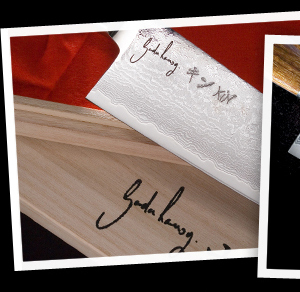 Many of the Kin Knives have the core of VG 10, including the Nashiji, Professional, Sekisou and Suminagashi ranges. The whole blade could not be made from this cutting core steel as it would be too brittle but by housing it between the two outside layers we now have the most suitable metal at the cutting edge. This is patently a much more sophisticated blade construction than just a single piece of ''do - it - all'' stain resistant steel. The resulting knife is strong, has a superb high carbon steel cutting edge and is much easier to re-sharpen when it eventually needs a sharpen. The laminating process also allows the blade to be thinner which translates as sharpness. A thicker blade requires more pressure to introduce it into a solid substance than a thinner one. Most western single piece stainless knives have a Rockwell hardness rating in the mid fifties. The core steel in Japanese knives by contrast have a Rockwell hardness in the mid sixties. 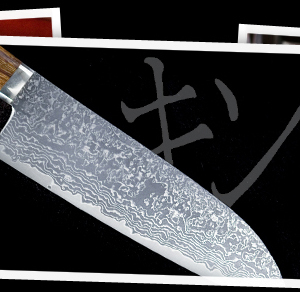 The whole blade geometry and refined construction of Japanese knives creates the sharpest knives in the world. More sophisticated knives are also available from Japan. These are the multilayered blades. These knives still have the central core of high carbon cutting steel but now instead of one layer on each side they have multiple layers. This is known as Damascus steel. This construction creates a beautiful visual effect and technically a stronger blade. The multiple layers, it must be stressed, have nothing to do with the cutting edge as this is controlled by the central core. These beautiful knives represent the skill and artistic talents of the knife makers. This type of blade is paying respect to the historical method of construction that was used in the Damascus steel blades of the Samurai swords. Samurai swords were made by layering and folding two types of carbon steel. This was done to create a strong blade. One of these steels was a harder steel than the other one. An interesting recent discovery has proved that the Samurai sword blade was only incredibly sharp when the stronger steel ended up at the cutting edge. Modern Damascus blades are made up of layers of high grade steels, come with a very high nickel content just to produce a visually beautiful blade. Just as there is an enormous amount of ignorance regarding knife construction there is the same lack of knowledge regarding sharpening. A butcher's steel is not the best way to sharpen a knife especially a Japanese knife. If you look at a knife that has been historically sharpened on a butchers steel it will display more wear on the blade nearer the handle. This is because of uneven sharpening pressure. Needless to say, anything that distorts the shape or geometry of the blade like that cannot be good for a knife. It is also virtually technically impossible to guarantee a consistent sharpening angle using a butchers steel. Any flat stone is a much more reliable sharpening product; this can be an oil stone, ceramic stone, water stone or diamond stone. These all work very well as they allow total control of the direction, pressure and angle. Layered Japanese knives as explained by their construction are easier to sharpen; they will just occasionally need a few wipes on a flat stone or indeed a Kin ceramic cone. The only time they may need more work is if they have been damaged by misuse. Japanese knives will chip if used on bone or frozen food, this is not a fault. They are so sharp they will actually cut into the bone but then a slight twist will quite obviously damage the blade. There are different tasks in the kitchen that require different tools. If cutting in or around bones need to be done then a specific boning knife or cleaver should be used. We have often heard chefs say that they want a knife to do everything. There are knives that you can use on bones but you then cannot expect that knife to also have a super sharp cutting edge. So a knife that does everything will have its quality compromised and will not have the sophisticated cutting edge of a quality Japanese preparation knife. Just like in woodwork if you want to cut a tree down you use an axe; if you need to cut a dovetail then you use a very fine saw.